This past July, I connected with Christine Donato, Integrated Marketing Senior Specialist at SAP, on LinkedIn. I was intrigued to learn more about her role in the IMC field and her involvement with the SAP Business Innovation blog. If you are not familiar with the SAP Business Innovation blog it has become the premier example on the proper way to leverage content marketing to increase digital reach. Even though I have not personally met Christine, she graciously agreed to be profiled for this blog post. Fellow IMC graduate student, Colin Haas, and I prepared seven questions for her across a variety of communications disciplines. The following areas will be highlighted as part of this interview: digital storytelling, best practices for career advancement, causes of employee disengagement, and details on her role as an Integrated Marketing Senior Specialist at SAP. Julie Long: Can you describe what a typical day is like as an Integrated Marketing Senior Specialist at SAP? 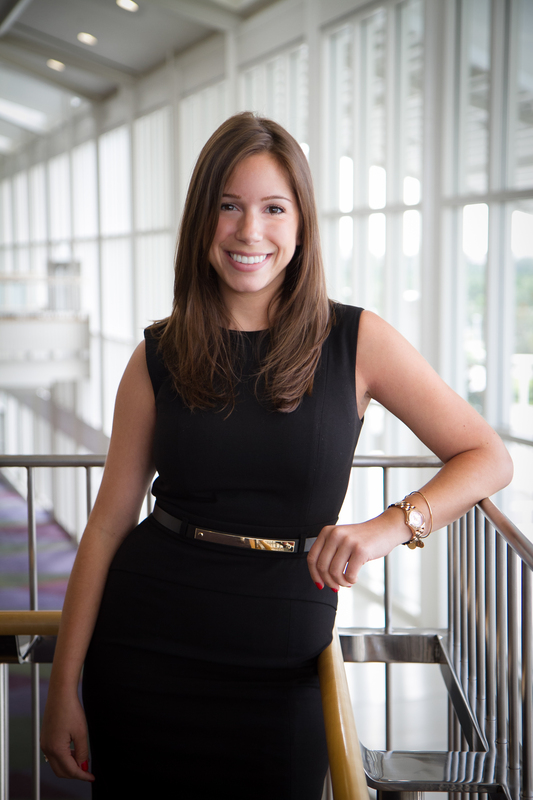 Christine Donato: As a social media blogger and promotions experts at SAP, my primary objective is to serve as the voice of SAP’s customers. What does that mean? Here’s an example. One of our customers is a large cancer research hospital in Germany. My objective is to interview that hospital, research the industry and interesting facts, and then write a credible, thought-provoking blog explaining this hospital, their patients, and the relationship they all have with SAP. In this particular case, the hospital is using SAP in memory computing to create specialized treatments that can better combat cancer. Typically though, my day varies, and for that I love my job. Some days my team and I star in short one-minute long videos that explain what SAP customers do. Some days I feel like I’m writing a research paper… endless searching to craft the perfect customer story. Some days I am in back to back meetings and brainstorming sessions, waiting for the next “big idea” to hit. Julie Long: WVU IMC graduate students are preparing a capstone campaign for St. Jude Children’s Research Hospital. The target audience is young professionals (21-30 years old). How would you go about planning a scalable event that could be replicated in other US markets? Could a virtual event be engaging enough to prompt the target audience to volunteer, champion, or donate to the cause? Christine Donato: As part of my previous role at SAP, I planned virtual events. The purpose of the events was to train our Sales colleagues on how to sell SAP Services. However, retaining the attention of busy Sales colleagues was no easy feat, and so we had to get creative. In this case, we needed to evaluate our audience and entertain them. To do this we incorporated gamification and short humorous videos throughout the training. My advice for planning a scalable virtual event would be to evaluate your audience. What do you want to achieve? With an organization like St. Jude Children Research Hospital (great choice, it’s one of my favorite charities), I would try to evoke emotion. In your advertisement and marketing efforts, I’d focus on a story of an individual child as opposed to large statistics and numbers. People are more likely to donate or volunteer if they can relate with a person in need. Julie Long: In what ways has digital storytelling positively changed the health care industry? Christine Donato: The health industry is a mess right now. People lack quality care. People lack insurance. People are not taking care of themselves. Hospitals are disconnected and unorganized. The government is disconnected and unorganized. It’s pure chaos. But I truly believe that if the country were to run on one unified technology platform, and all patients and hospitals were unified under one system, we could cut significant administrative costs and complexity. With digital storytelling, I can express this notion in many ways, and hopefully, with each reader, we gain one more advocate for technology in healthcare. Colin Haas: What skill or skills are you looking to learn, that you feel are important to your career? Christine Donato: I am looking to develop my leadership skills. As a young female professional, I think it’s important to build your executive presence early. Carry yourself professionally and always expect respect. Colin Haas: You have been building a great career with SAP, what do you think has helped you go from where you started, to your new role as Sr. Integrated Marketing Specialist? Christine Donato: Networking! At SAP especially, networking is key. I started at SAP in 2011 as an intern and each week I set up a coffee meeting with a new person. My goal was to expand my network as much as possible to hopefully land a full-time role at the company. To this day, I still try to meet a new person each month just to get my name out there. In addition, I’d recommend finding a mentor. Having someone you can trust and can speak to in confidence, will go to bat for you, and can coach you is invaluable. Colin Haas: You recently tweeted an article from Gallup about how workers are not engaged in their work, which I would agree with. What are your thoughts on the causing? Is this something that is the fault of the employer or another factor? Christine Donato: I think that half of the problem with employees losing engagement is the confinement of a 9 to 5 role. I’ve found that a flexible work schedule helps to keep employees engaged. Instead of sitting in front of a computer screen in the office “working” from 8am until 5pm, with a flexible schedule you can take an hour break to exercise, do laundry, run an errand… whatever it is that you need to do, and then return to your computer screen recharged and ready to actually work. Colin Haas: I am a huge advocate of LinkedIn and Twitter, but some are slow to really adopt a strategy of using it to grow their network. What would you tell the young marketing professional that is slacking or putting off using these networks, on a consistent basis? Christine Donato: Connect with every professional you meet on LinkedIn. You’ll never know when it can come in handy. Until I became a blogger and shared my LinkedIn as a promotion channel for my blogs, I didn’t accept people on LinkedIn that I had never met in person. Unless you’re a blogger on LinkedIn, I’d stick to that rule. Don’t connect or accept people that you’ve never met in person. As far as Twitter, I think it’s a great place to grow your brand. Follow and be followed. Tweet out anything that interests you and make intelligent commentary on articles you read. I just caution you to be professional. Once you put it out there, you can’t take it back. On behalf of the West Virginia University Integrated Marketing Communications Program, I would like to thank Christine for sharing her point of view with all of us! Be sure to follow Christine on social media for the latest insights on the healthcare industry, recent advancements in the technology field, and best practices for content curation. A few years ago I was introduced to a fantastic book called The Brand Gap. Since then I have been making my way through Marty Neumeier’s other fantastic books. A while back I read Zag and have been picking up a book here and there between classes. I just finished The Designful Company and am very excited to start The 46 Rules of Genius. As usual The Designful Company did not disappoint. These books are fantastic because they’re written in a causal tone and designed to be read on a short flight. They also come in very handy when working with executives on a project. Our entire staff read The Brand Gap when working on our branding study a few years ago. They’re small books, but pack quite a punch. So, without ruining the reading experience for you, I wanted to share a few things from The Designful Company that I found very valuable. 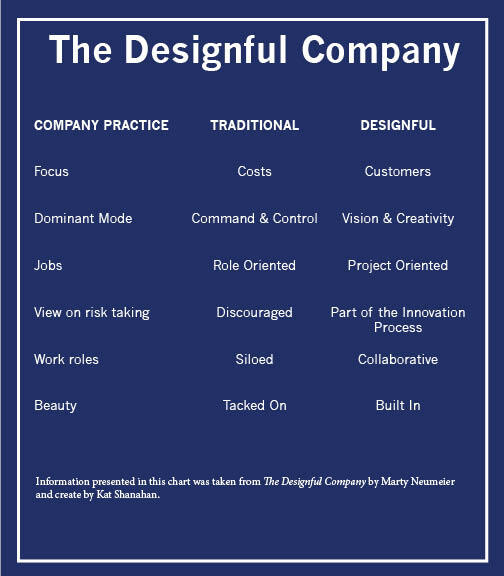 First, let’s start with what differentiates a “designful” company from the rest. Neumeier discusses how imperative it is to redefine the word “design” and think of it not as a function of the marketing or graphics office, but rather viewing everyone who tries to change an existing situation to an improved one as a designer. Being a “designful” company means creating a culture with innovation at its foundation, rather than trying to make innovation something that a company does. The same can be said for a brand. Too many time I’ve heard companies say “we’re going to take 20 minutes to talk about branding” instead of making it the core of their organization and integrating it into all of their daily activities. I think that creating a designful company helps to break down those silos. Again, it doesn’t fall into the “something you do” category, but rather the “who you are” category. In The Designful Company Neumeier talks about connecting those silos and exploring opportunities for “cross-fertilization and creative collaboration.” The most exciting idea was that positions such as Chief Brand Officer, Chief Design Officer, or Chief Innovation Officer could be titles that those of us in this program could one day hold. I could write a few thousands words on the importance of creating a designful company, but I’ll share a few last words from Marty Neumeier and encourage you to pick up a copy of the book. If you do, let me know what you think! Design drives innovation; innovation powers brand; brand builds loyalty; and loyalty sustains profits. If you want long-term profits, start with design. To make sure that you have the best experience at INTEGRATE 2015, I will be profiling a few of the speakers as part of a multi-part blog series. Rod Brooks, V.P. 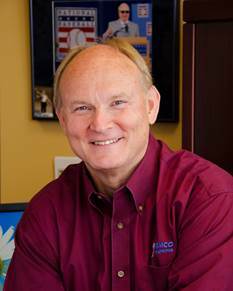 & Chief Marketing Officer – PEMCO Insurance, is the first speaker on the list. In an email interview, Rod answered a question I presented to him about digital strategy. His answer below is a great preview of the caliber of marketing wisdom he will be sharing when he takes the stage at INTEGRATE. Rod – On social media you posted the following Forrester quote: “74% of business executives say their company has a digital strategy, but only 15% believe their company has the skills and capabilities to execute.” This is a very scary statistic! Of the 15% minority, what skills and capabilities do you view as being important to their success? Would having an integrated marketing skill set be a plus? It’s a great question Julie. There is definitely a talent gap between the digital marketing requirements of today’s brand marketers and the skills that exist within the available work force. There’s no doubt that students with an understanding and experience of an integrated approach to marketing will have an advantage. Keeping in mind that there isn’t a “one-size-fits-all” solution, I believe that it will be critical for successful marketing leaders to close the gap in six key areas. 1. Business Planning. In order to execute a digital marketing plan you first have to be capable of writing or informing one. A digital marketing plan must serve a business purpose. Starting with a clearly written objective, a business plan should outline the goals, risks, resource requirements, budget, and a high level concept of the plan. From there a digital roadmap, or plan of action, will be created to serve as the “blueprint” for execution. 2. Analytical Planning and Assessment. You can’t improve what you can’t measure. And you can’t measure what you aren’t analyzing. In this era of relevance, marketers must use data driven marketing to assess the competitive landscape. Similarly, marketers must be equipped to analyze customer segments for their uniqueness and specific interests in order to deliver relevant messages to the right people at the right time. It will be essential for digital marketers to have members of their staff who have learned the ins and outs of web analytics, including conversion optimization and A/B testing. The talk about “big data” is more than hype. Brands that fail to close the analytics gap will quickly fall behind in today’s fast-paced digital world. And, I must add, these are not skills that baby boomers – people like me – were taught as we entered the business world and advanced in the marketing profession. This will be an era of the employee teaching their leader. 3. Mobile Marketing. The mobile first revolution is real and it’s now. Brands are working hard to catch up with the momentum that this wide sweeping technology has put in the hands of consumers. Unfortunately, the talent that is needed to make the move is scarce and underdeveloped. Talent requirements include a clear understanding of how to drive business success through the use of responsive design, differentiated mobile applications, and contact management systems, just to name a few. 4. Marketing Automation. Those who understand the tools and platforms that enable increased effectiveness and efficiency are in high demand by winning brands and agencies alike. I don’t see this trend slowing down anytime soon. Students who are able to influence and introduce best practices in areas like big data, predictive analytics, customer relationship management, and lead scoring and nurturing are certain to have an advantage in the marketplace. 5. Creativity. In order to set brands apart from their competition an element of creativity is going to be required. This is as true in digital marketing as in any other discipline – if not greater. Whether writing website copy, instituting a lead nurturing plan, or developing your brands “killer app,” creative talent is needed to design the user experience. There’s no real substitute for creative confidence. I encourage everyone to build it within themselves in the areas that they are most passionate about. 6. Writing. I was in the audience when former CBS News anchor Dan Rather addressed an audience of college students attending a communications symposium. Rather offered three tips that, he said, would ensure the success of every student with an ounce of ambition in the room. His list, in priority order: First, learn to write. Next, learn to write. And third, learn to write. His point was well made and is of critical importance. While our world is changing and digital sharing and marketing are here to stay, nothing has replaced the need to be capable of communicating. Learn to write. Attend INTEGRATE 2015 and learn from incredible marketing leaders at St. Jude, HGTV, SeaWorld and more! Looking forward to seeing everyone this May in Morgantown, WV! Who has already purchased a ticket? My sophomore English teacher encouraged me to always read with a pencil in hand. I thought reading was the one subject that didn’t require a pencil, but pencils are my bookmarks now. I judge a book by how many pencil markings are scribbled once I reach the last page. The Power of Habit by Charles Duhigg is my new #1 pencil-scribbled book. It is rich with insight for marketers. 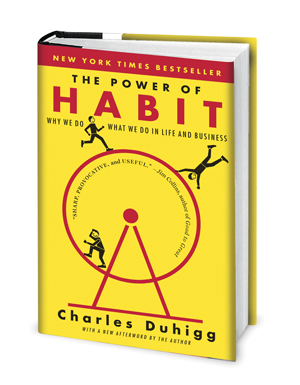 “The Power of Habit” by Charles Duhigg is rich with consumer behavior insight for marketers. As marketers it is important to know consumer behavior in your category. If you’re marketing peanut butter, you have to understand what triggers the craving for a pb&j sandwich or a spoonful of crunchy. If you’re marketing a TV show you have to understand the behavior behind viewing choices. Is a 30-something year old viewer seeking out a program her high school basketball teammate who she doesn’t actually talk to mentioned on Facebook? Is there a closer circle of influence on her viewing decisions? Is she surfing her favorite networks in a habitual way? What is the cue that triggers the routine of watching a particular network or program? 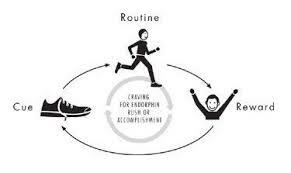 The habit loop of a runner is a good illustration of how habits are fueled by cravings. Runners know this habit loop. The perfectly placed running shoes by the bed or the backdoor are the morning’s cue for a run. The craving for an endorphin rush fuels the routine run. The reward is a sense of accomplishment or the pride and recognition a runner’s selfie, which are increasing in popularity. The Habit Loop is a framework for creating repeat business. As we read in marketing text books, it is easier to gain repeat business than acquire a new customer. Can you define the craving that fuels the habit loop for the product you market? What’s the cue that prompts the routine? What’s the ultimate reward? It’s Not Just Business; It’s Personal, Too. What differentiates one company from another? Services, characteristics, location? One of the top distinguishing factors is the company’s brand image. It’s not just about what the company does and what they sell; it’s about how customers view them. Some companies have customers that are so loyal they tattoo the company logo on their bodies! If branding is so important, why is a personal brand often forgotten? 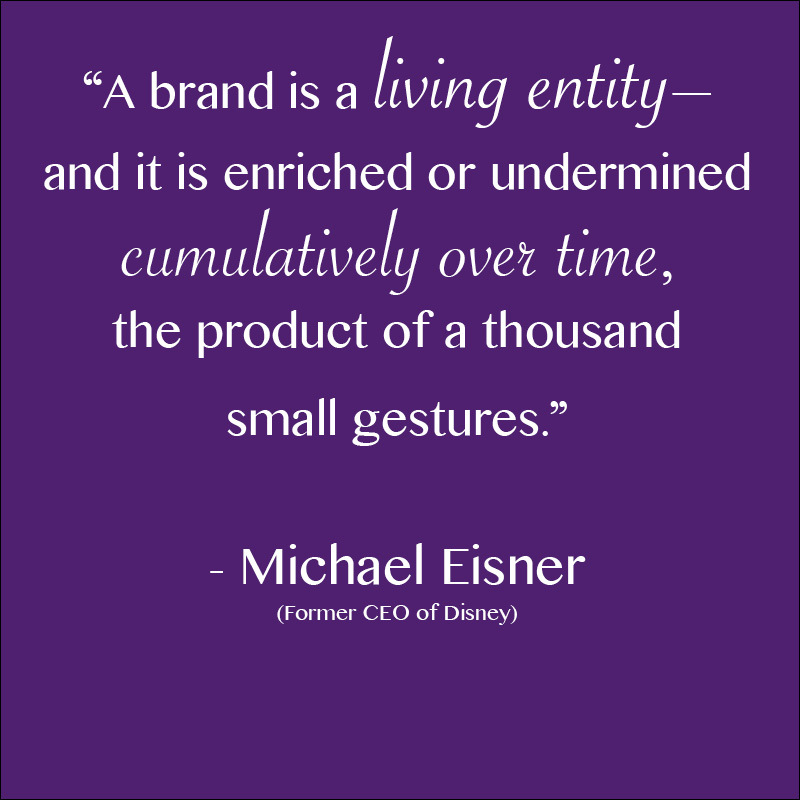 Below is a favorite quote of mine that applies not only to a company’s brand, but also personal branding. Just like a company’s brand image, a personal brand image is not built over night. You can’t stay up all night coding a new web site, designing business cards, and reworking your resume and think that you suddenly have a brand. Like Michael Eisner said…these things are built over time. Your brand encompasses everything about you – your skills, characteristics, personality, resume, online presence, etc. If all of those things are communicating different personalities to viewers, what does that say about you? Your brand is what other people think of you, so it’s important to put your best foot forward and make every encounter and interaction you have consistent with who you say you are. In addition to keeping that in mind, below is information I’ve collected over the last few years to help people enhance their personal brand. Determine how you want to be viewed. When people think of you, what do you want them to think? Ask yourself some foundation questions. What do you do better than anyone else? What do you get complemented for the most? How do you do what you do? Is it different than other people who are doing the same thing? What do you want to do? What are you most passionate about? Who else has your name? What are other people with your name doing online? How much time do you have to dedicate to building your social media presence? It’s better to do fewer platforms well. Again, your personal brand encompasses all aspects of your skills, personality, digital presence, and attitude. When looking at everything from the way you dress to the Facebook profile photo you have, do you like what it’s saying about you? Doesn’t INTEGRATE 2014 seem like yesterday? For me, one of the highlights of INTEGRATE was meeting Dr. Karen Freberg in person before PR Concepts & Strategy began in summer session. It marked the first time I’d met an IMC instructor before beginning class. Dr. Freberg is so friendly! If you haven’t met her, learn about her background here. 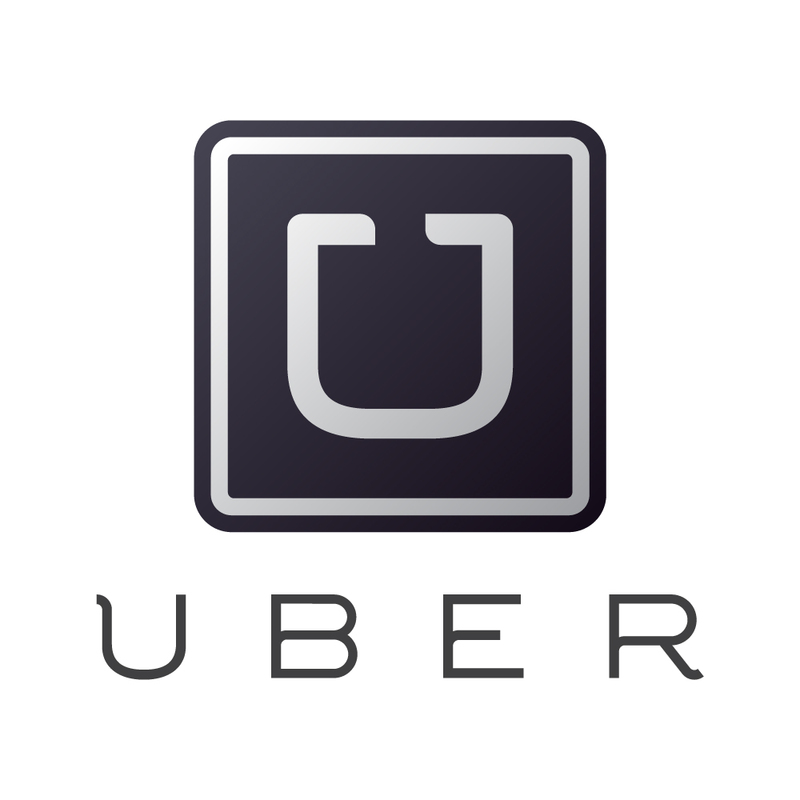 Continuing with the Q&A’s (read my interview with Dr. Larry Stultz), I thought I’d reach out to Dr. Freberg to get her input on Uber’s recent PR problems, what she considers the top three PR strategies, and what not to do in a press release. Q: What role does public relations play in today’s IMC mix? A: PR plays a huge role in today’s IMC mix. It’s a profession that continues to evolve along with the changes we are seeing in society with the technology advances, changes in consumer attitudes and expectations, as well as helping to address crisis situations. In addition, we see PR play a stronger role in investing in the relationships between not only brands and their audiences, but with fellow professionals. PR is all about the human-to-human interaction as Brian Kramer has stated and it also focuses on the importance of storytelling and return on relationships within the community. Q: Are there any campaigns – past or present – that you believe should receive more recognition? A: This is a great question – there are so many to choose from! I’d say that there are a few campaigns that have really struck out to me include the following: Chipotle and the Scarecrow Campaign, ALS Ice Bucket Challenge, Coca-Cola’s Share a Coke Campaign, Dove’s Real Beauty Campaign, WestJet’s Christmas Campaign, and Starbucks and Tweet-A-Coffee. All of these campaigns have unique qualities, effective brand storytelling elements, and were able to connect with their audiences with emotion, action, and build a stronger relationship with their community. How should Uber handle its recent PR disaster? Q: How do you think the recent anti-journalist PR disaster will affect Uber moving forward? A: I think this is an interesting case because Uber is a company that is either viewed very positively or very negatively – so it’s a polarizing brand right now because of their actions. I do think that they are facing challenges right now with this particular issue and they need to adapt not only their PR actions and practices, but it really does come down to the internal corporate culture and leadership to really make the changes necessary. Time will tell to see if they address these concerns. Q: What are the top three PR strategies? A: Education is always a good measure, especially if you are looking at new technologies or creating awareness about a new initiative or product. Another one that is good to do is engage with audiences through storytelling principles through content creation and curation measures. Lastly, driving effective partnerships with credible third party endorsers, influencers, and opinion leaders is another one we see to be effective. However, PR strategies are the most effective if they are tailored for the company and audience in question – it’s all about connecting the dots. Q: When writing press releases, what do we not want to do? A: There are a lot of things not to do in a press release. Forgetting who you are targeting, making spelling and grammar mistakes, just using the press release to promote yourself, using jargon that is not familiar with your audience, and not including all of the added multimedia/social media content expected for press releases now. Thanks to Dr. Freberg for answering my questions! Are you reporting findings or sharing insight? One of the challenges in market research is sharing what you learned. Formal training and years in the field hone your survey development skills and ability to interpret what consumers are really saying in focus groups, but sharing what you learned is a fine art. So the big question is: are you sharing findings or insight? A finding is simply a fact – a data point, a stat, a plot on a line graph or a quote from a focus group respondent. An insight is “a penetrating, discerning understanding that unlocks an opportunity” (source). Market research reports should unlock opportunities, not just report the findings. Marsha E. Williams of Harvest Research Group and formerly head of consumer insights at Viacom, organizes her thoughts this way: “Findings are often nice to know; insights should be considered need to know. All insights are findings, but not all findings are insights” (source). If I pretend I’m in market research for a peanut butter brand then it is nice to know that 20-somethings love peanut butter because it is their go to ingredient for a quick meal, keeps in the pantry for a long time and is affordable. What PB brand management needs to know is that peanut butter is their comfort food and fondly reminds them of childhood. That’s what ad campaigns are made of these days – not just that PB is a go-to ingredient, but that it conjures up fond memories. Understanding PB’s role as a nostalgia trigger in these 20-something lives “unlocks an opportunity” for marketers to tug at the heartstrings of the target audience. Are you reporting the findings or unlocking opportunities? … At least, that’s how some marketers like categorize me. 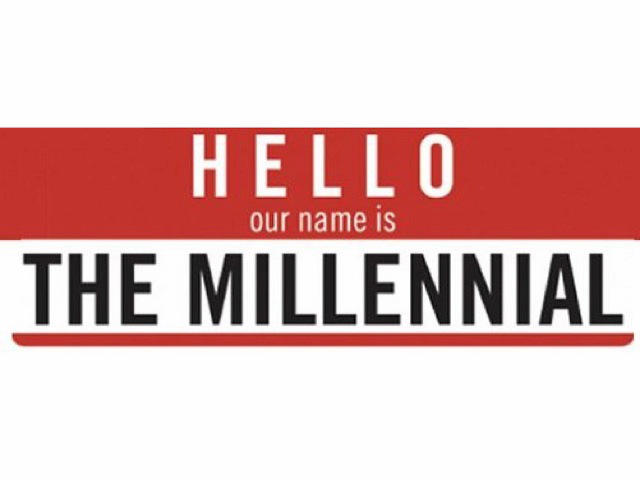 Millennial marketers, does being a millennial help you market better to the generation? Adweek recently posted an article about how digital advertising network Exponential has categorized millennials based on the group’s reaction to three things: the economy, globalization and social media. While we are known to dislike generalizations about our generation, I found the 12 millennial subgroups fascinating- Personally, I identify most as a Millennial Martha. How will marketers categorize Gen Z into subgroups? One of my goals in completing the IMC program is to catch up my digital knowledge to equal that of someone born in 1997. Although social media has been around for 10 years, I still consider it a new, fleeting subject, when in fact, it is very much here to stay. Social Media and Marketing is further changing my opinion of its usefulness in business. But social media has also opened up the formerly buttoned-up business of government. Five years ago, state and federal government agencies were unsure how to be on social media without fear of losing control of the message. Today social media plays a starring role in communications strategies – especially with the 18-24 demographic. DigitalGov is a great resource for exploring how government agencies are embracing digital, including social media. 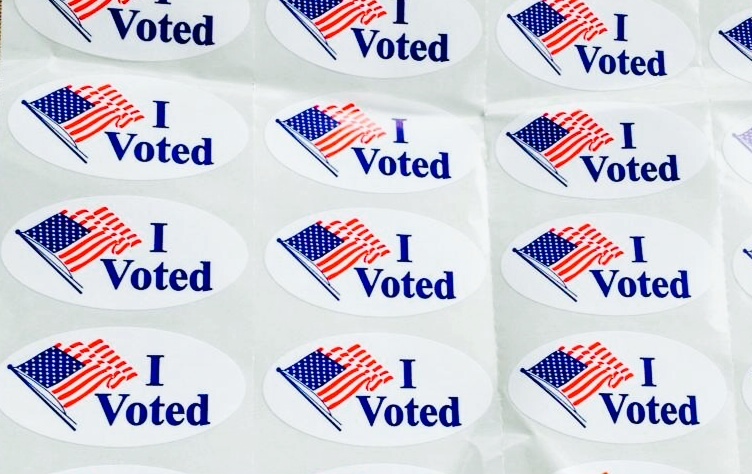 On Election Day, my Facebook and Twitter feeds were inundated with “I voted” posts. I voted too, but decided not to join the masses in declaring the deed. Maybe I should have. The USA.gov social media team launched a real-time campaign to answer voting questions and encourage people to vote. People could take #ElectionSelfies with the “I voted” sticker. The team then retweeted 70 of these selfies and thanked 100 random people for taking the time to vote according to Jessica Milcetich, Social Media and Digital Strategist on the USA.gov Outreach Team at the U.S. General Services Administration (GSA). Two years ago, when Hurricane Sandy pummeled New York, emergency management personnel relied on social media to get information to people and in a sense comfort them said Emily Rahimi, the New York City Fire Department’s social media manager in a recent interview with Emergency Management magazine. Transparency is a huge buzzword in government. Social media has provided communicators a platform to be real with people. This infographic from MPADegree.org shows just how government uses social media. You are currently browsing the WVU IMC Blog blog archives for December, 2014.